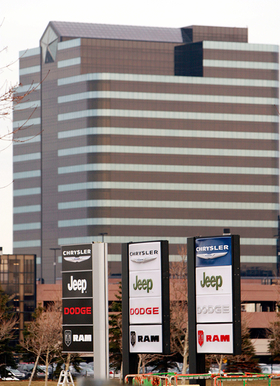 DETROIT – Chrysler Group posted a net loss of $370 million in the second quarter due to costs tied to the repayment of government bailout loans. The loss came after the automaker recorded its first post-bankruptcy profit three months ago. Chrysler incurred a charge of $551 million in paying back the U.S. Department of Treasury and the Canadian loans that kept the automaker afloat in 2009. "Modified" operating profit nearly tripled from a year earlier to $507 million, while revenue climbed 30 percent to $13.7 billion, the company said today. Helped by new models and a big advertising push, Chrysler's second-quarter worldwide sales increased 19 percent to 486,000 units. Cash reserves rose $300 million during the past three months to $10.2 billion. "There is no doubt that Chrysler Group has taken a huge step forward this quarter," CEO Sergio Marchionne said in a statement. "Refinancing our debt and repaying our government loans six years early reinforces our conviction that we are on the right path to rebuilding this company and restoring it to its rightful place on the global automotive landscape." In the first quarter, Chrysler recorded a net profit of $116 million, its first since exiting a U.S.-steered bankruptcy under the control of Italy's Fiat S.p.A. The May 24 repayment of $5.9 billion to the U.S. government and $1.7 billion to Canada, six years ahead of the original schedule. Refinancing its debt with a $3.0 billion senior secured loan, $3.2 billion in secured notes and a $1.3 billion revolving line of credit. Worldwide shipments rose 19 percent to 514,000 units and marked this first time that figure had topped 500,000 units in a quarter since Chrysler exited bankruptcy in June 2009. As part of the refinancing, Fiat exercised an option to lift its stake in Chrysler to 46 percent from 30 percent. Last week, Fiat ended U.S. and Canadian taxpayer ownership by paying $625 million to acquire the U.S. Department of Treasury's remaining 6 percent holding as well as Canada's 1.5 percent stake. Under terms of the bailout, Fiat will be allowed to boost its stake by another 5 percentage points, to 58.5 percent, by building a 40 mpg car in the United States. That is expected to happen in the fourth quarter when Chrysler begins assembling a replacement for the Dodge Caliber in Belvidere, Ill.
A UAW health-care trust will own the remaining 41.5 percent of Chrysler. Chrysler said its adjusted net income for the second quarter was $181 million, compared with a loss of $172 million in 2010. The company projected revenue for the full year at over $55 billion. Modified operating profit for 2011 will be $2 billion, Chrysler said. Marchionne, who is working to unify the companies under a single management structure as soon as this week, is aiming for $140 billion in combined Fiat-Chrysler revenues by 2014. The company is introducing 16 new- or revamped vehicles in the United States this year. The rejuvenated lineup has pumped some life into Chrysler sales, which rose 21 percent in the first six months over the same period in 2010. That number is far below the 45 percent increase Chrysler sales executives set as a goal when they addressed dealers at the NADA convention in February. According to data released by TrueCar.com, Chrysler has made some progress in some other key industry metrics. The company's average transaction prices are up 11.4 percent during the first six months of the year; incentive spending per unit has dropped 19.3 percent and the percentage of units sold to fleets has dropped 8.9 percent -- from 40.5 percent for the first six months of 2010 to 31.6 percent a year later.